Thales unveils the cockpit of the future "Avionics 2020" at Paris Air Show 2013. On the opening day of the Paris Airshow 2013 Thales, world leader in avionics innovation is proud to unveil the cockpit of the future. Named Avionics 2020, this cockpit is the natural evolution of the cockpit concept for which Thales has become famous, the ODICIS demonstrator. Unveiled at the last Paris airshow, the ODICIS concept illustrated the technologies and innovations Thales imagines will be need on commercial aircraft in the next 20 years. Thales avionics 2020 incarnates a new-generation cockpit founded on the principles of natural and direct hands-on interaction and human-machine interfaces. With the groundbreaking Avionics 2020 cockpit, Thales demonstrates to the world, the technologies and concepts manufacturable now and which can be made flight-ready on commercial aircraft in the next 7 years. Avionics 2020 incarnates a new-generation cockpit founded on the principles of natural and direct hands-on interaction and human-machine interfaces, designed to serve the pilot through the use of the latest head-up and head-down technologies. It’s totally scalable model, can also include bi-chromal head-up displays enabling enhanced collimated piloting data organisation and discrimination, associated with a synthetic representation of the outside environment. Much like its overall avionics, the human-machine interface of Avionics 2020 can connect to core functions supplied by third parties. Furthermore, it can be personalised so as to merge with the cockpit concept as defined by the customer. Personalisation duties can interchangeably be handled by Thales or by the customer, who may wish to retain control over IP aspects and enjoy greater autonomy in the development and management of changes to their solution. The cockpit’s concept introduces a modern and effective cockpit implementation which integrates a large, secure display area associated with several reconfigurable means of control. This user-friendly organisation of the cockpit incorporates multi-touchscreen capabilities, offering pilots an intuitive interaction solution comprising all aircraft systems and functions. Continuing on from the most important innovations presented on the 2030 concept, Avionics 2020 is centred on enabling pilots to capitalise on their strengths and help them manage their weaknesses. 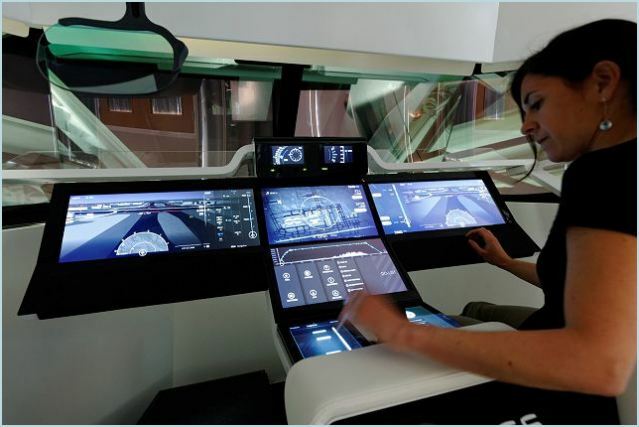 Thales has therefore worked closely for a number of years with researches, scientific institutions and world class experts in the field of human-machine interface, to refine its understanding of this field of development. These efforts, culminated into a cockpit entirely focused on the tasks to be completed by the pilot. It achieves this by merging data from the different avionics and non-avionics systems and present them to the pilot in a transparent manner, making decision instinctive and less reliant on cognitive analysis, thus mimicking the processes which the human brain goes through in order to make a decision, especially under stress. Perhaps most significantly, this cockpit anticipates the future challenges of the air transport industry, in their continuing efforts to maintain growth trends in air traffic, whilst at the same time reducing carbon emissions, noise pollution and ease congestion in the skies without compromising safety standards. This critical future proofing is accomplished with the integration of SESAR and NextGen capabilities already built into the cockpit so that the pilot can easily and efficiently use the full range of the new functions required by these programmes. The capabilities built into the cockpit include I4D operations, which consist of giving the pilot a time constraint at metering point to each aircraft converging to this point, in order to better sequence traffic. Furthermore D-Taxi (Digital-Taxi) functionalities will be included in the cockpit. D-Taxi is a real-time uplink of the cleared taxi route via CPDLC (Controller-Pilot Data Link Communications) and representation of the taxi path in the cockpit systems. In addition, ASAS (Airborne Separation Assistance Systems) will also be displayed. ASAS spacing helps create a regular traffic flow by ensuring an aircraft adjusts its speed so that it can keep its spacing relative to another aircraft, and therefore merges according to the requirement set by the controller. And finally the ground-breaking Thales concept of ECO Take-Off, will be available on the Avionics 2020. ECO Take-Off is an optimised take-off and climb profile in order to define the trade-off between CO2 emissions and noise reductions. Commenting on this seminal moment for the Thales civil aerospace business, Denis Bonnet, Head of Innovation for the Cockpit Competence Center said: “In this exercise we took a leaf from the Automotive industry. The ever popular 'concept car' exercise employed by successful auto makers is an invaluable process, which over the years, has allowed them to find the innovations and new implementations that have given us the most successful car models ever made. By using this same thought process, we designed ODICIS to think of the far future, and used this exercise to give us the inspiration to come up with all the practical applications we are outlining in the 2020 cockpit here at the Paris Air Show. Outlining his thoughts on the importance for the industry, he added: “This is indeed a seminal moment for us and the industry. We are showing the world that a cockpit designed around more seamless interaction between the pilot and the electronics is no longer a purely intellectual concept, but a viable commercial application which, as more and more functionalities and tasks are added to a pilot's workload, will become essential for the future of air transport. In that, we can safely say that Thales's HMI centric concepts such as Avionics 2020 will be new meter of comparison for commercial aviation in the XXI Century. Avionics 2020 is the cockpit of the future”.